Here’s the Bainbridge Islander preview for May 3. Feel free to give your events a plug in the comment section below. 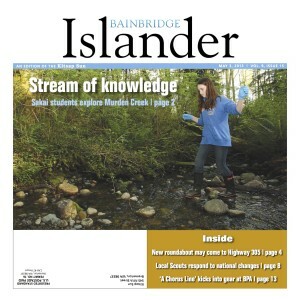 STREAM OF KNOWLEDGE | Sakai Intermediate School students join cleanup of Murden Cove watershed. ROUNDABOUT FOR 305? | The state says replacing a signal with a roundabout at Highway 305 and Suquamish Way would improve traffic. LOCAL SCOUTS WEIGH IN | Local Boy Scouts respond to the national organization’s proposal to lift its ban on gay members. ‘A CHORUS LINE’ | The demanding musical comes to Bainbridge Performing Arts. COMING UP: Community discussion begins on a possible school closure. The park district and Land Trust celebrated the opening of the Hilltop park and trail on Wednesday. Weather: This forecast looks too good to be true. The National Weather Service predicts sunshine and highs in the 70s for Friday through the weekend. Sports: Spartans softball hosts Lakeside today at 4 p.m. Baseball opens league tournament play Monday against West Seattle. The defending 3A state champion soccer team earned a rest until May 8, after clobbering Lakeside. The First Friday Art Walk for May is tonight at venues around Winslow. Bainbridge High School Theatre presents “Pippin” at 7:30 p.m. Saturday. A vocal showcase is on tap for the First Sundays Concert for May. Waterfront Park Community Center welcomes mezzo-soprano Cheryse McLeod Lewis, soprano Jacqueline Quirk, and tenor Eric Neuville. The show starts at 4 p.m. Pick up this week’s Islander or check the Sun’s events page for more listings. Follow us on Facebook and Twitter for updates throughout the week. Contact Bainbridge correspondent Tad Sooter at tad.sooter@gmail.com.